Poorly aligned teeth? Think it takes forever for braces to straighten them? Think again. There are many new types of braces and cosmetic dentistry services available in Brentwood. If you are considering straightening your teeth, come into Nashville Center for Aesthetic Dentistry in Brentwood for a cosmetic consultation. We can discuss the new types of invisible braces. Dr. Dennis Wells, DDS, will also explain ways of making your teeth look straight with dental veneers or dental crowns. 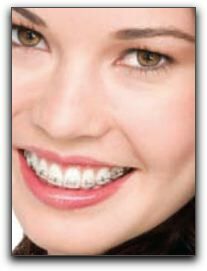 The first things most adult Brentwood teeth-straightening clients ask about are the newer systems, sometimes called clear braces and adults braces. Many of our adult patients have been embarrassed by their crooked teeth for many years and have developed a habit of covering their mouth when they smile. It is great to see them smiling confidently after they have completed treatment. Many Brentwood patients have taken advantage of cosmetic dentistry services such as dental veneers. Their smile is restored in a short period of time. There are many kinds of dental veneers such as prepless veneers that can be applied in one day also known as DURAthin veneers that keep the underlying tooth as it is. Other patients choose porcelain veneers. If you want to know more about these procedures contact the Nashville Center for Aesthetic Dentistry.